As it rolled across the Atlantic Ocean, Hurricane Florence strengthened into a near Category 5 monster. But when it eventually made landfall on the beaches of North Carolina in September, the hurricane would weaken into “only” a Category 1 storm. Florence’s downgraded status gave residents a false sense of security. That is, until they witnessed firsthand the full brunt of the hurricane’s epic flooding, coastal storm surge, and sustained winds. Many homeowners who chose to ignore evacuation orders were surprised by the rising flood waters; some had to be rescued from their rooftops. The complacency around Florence seems to have extended into the philanthropic realm as well. 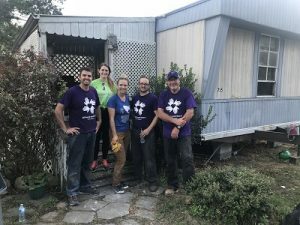 Anecdotal evidence from our partnerships team at Good360 and corporate giving levels after Hurricanes Florence and Michael suggest that donor fatigue has set in after last year’s calamitous string of Category 4 storms. Corporate donors have pledged at least $21 million in Florence-related relief (there aren’t any reliable giving figures for Michael yet). Many brands such as Anheuser-Busch, Home Depot, and Procter & Gamble’s Tide quietly gave millions of dollars worth of in-kind support. At Good360, we are proud to partner with donors who truly understand the need for long-term support. These forward-looking companies include American Eagle Outfitters, which generously donated a cash grant of $100,000. This is allowing us to distribute more than $1 million in product donations. UPS Foundation helped us pre-position and distribute critically needed goods in strategic locations throughout the southeast. We also received cash donations from Assurant and RH (Restoration Hardware). Both Crate & Barrel and Wrangler set up giving platforms for associates and customers to help with Florence recovery. These efforts are dwarfed, however, by the outpouring of activity in the aftermath of Hurricane Harvey. The Center for Disaster Philanthropy estimates that corporations and foundations gave more than $336 million for Harvey recovery. While it’s true that Florence didn’t match the level of devastation from Harvey, that’s not to say that the hurricane didn’t pack a lethal punch. In fact, the Category 1 storm was the wettest storm in more than half a century, second only to Harvey. It brought a staggering level of damage to the three hardest hit states — North Carolina, South Carolina and Virginia. The actual disaster zone was much larger than Hurricane Matthew in 2016. Moody’s estimates the cost of damage wrought by Florence could be as much as $50 billion. What many Americans might not have noticed amid the 24-hour hurricane coverage were the hidden stories of devastation. These include North Carolina farmers who saw their soybean, peanut, cotton, and tobacco crops nearly wiped out by the floodwaters. Millions of livestock animals were also drowned. The impact is being felt not just by the farmers themselves, but also by everybody who depends on the farms being in operation for their livelihood, including the field workers and their families. Marlow emphasized that many of these farms sell very low-price commodities and were already financially vulnerable. Our disaster recovery team at Good360 saw firsthand the fury of Florence when we visited New Bern, North Carolina. 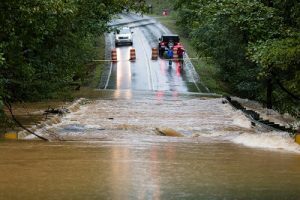 The storm devastated the town at the convergence of the Trent and Neuse rivers, leaving homes, businesses, and streets flooded for days. Hundreds of residents had to be evacuated by swift-water rescue teams. We activated our giving network to bring at least $1.2 million worth of product donations to New Bern, including diapers, cleaning products, and personal hygiene items. Our corporate partners in this effort have included Domtar, CVS Health, Hasbro, UPS Foundation and others. However, what we’ve seen with donations earmarked for Florence has been significantly less activity compared to last year. 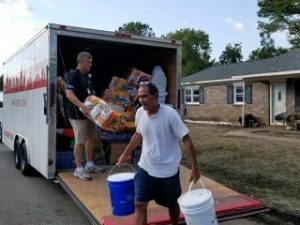 It’s clear that disaster giving has slowed since the massive media coverage following Harvey. For instance, the American Red Cross saw donations to recovery efforts dwindle from $350 million for Harvey to $56.4 million for Irma, and just $31.6 million a month after Maria. That downward trend seems to be continuing in the current hurricane season. While we’ve always advocated taking a more measured, thoughtful approach to giving and not rushing into making donations without understanding the actual needs of the impacted community, corporate donors can take important steps to ensure that help is on the way. For example, they can make a public commitment now to support affected populations with in-kind or cash donations in the future. This is what Rooms To Go did when it pledged to give $2 million and to furnish 2,000 rooms in the aftermath of Hurricanes Harvey and Irma. Rooms To Go partnered with Good360 to fulfill part of that promise. Public pledges allow companies to stay top of mind in the recovery conversation, while donations can be carefully planned to make the most effective impact when the time is right. We can work with interested donors to customize their giving strategy as well as their public relations messaging. Please contact Jim Alvey at jalvey@good360.org.